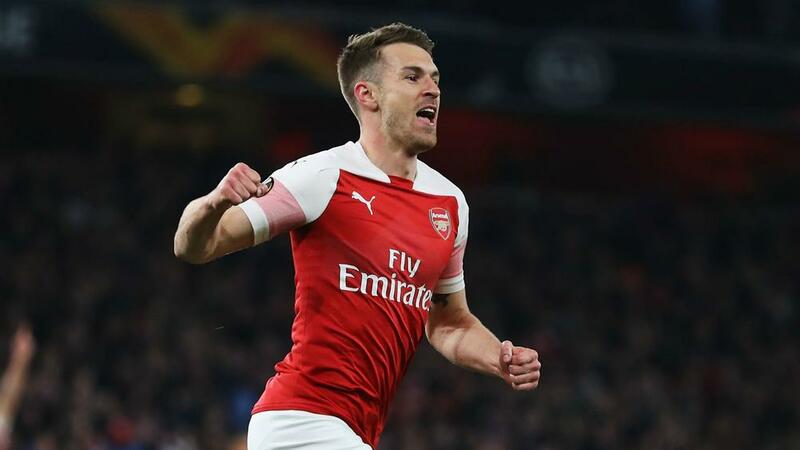 Aaron Ramsey's strike and Kalidou Koulibaly's own goal earned Arsenal a 2-0 home win against Napoli in the first leg of its UEFA Europa League quarter-final. Ramsey finished off a stunning move to open the scoring and Lucas Torreira's drive deflected in off Koulibaly to double Arsenal's advantage before the break at Emirates Stadium on Friday (NZST). Serie A side Napoli struggled to impose itself on the contest, although Lorenzo Insigne and Piotr Zielinski had big opportunities, and Carlo Ancelotti's men have work to do in next week's return. Koulibaly made a superb pair of blocks to repel Ramsey and Ainsley Maitland-Niles but he could do nothing about Arsenal's excellent opener in the 14th minute. Ramsey's interception sparked a tremendous team move, the midfielder swapping passes with Mesut Ozil before Alexandre Lacazette and Maitland-Niles combined beautifully to set up the Wales international for a placed first-time finish. Arsenal pushed for a third, though, with Meret superbly keeping out Ramsey's drive and Nacho Monreal planting a free header over the crossbar from the resulting corner. And Ramsey and Aubameyang should have made the visitor pay, wasting late chances to leave Napoli with some hope.